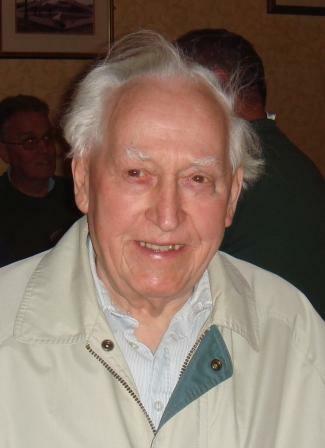 It is with great sadness that we report the passing of our Club President, Lew Williams on Monday 30th May 2011. Lew was aged 92 and had been in poor health for some months. His funeral took place at the Robin Hood Crematorium on 21st June. Lew leaves his widow Cynthia and two daughters, Judy and Marion. Many of us will remember Lew for his wonderful reminiscences’ of his military experiences as a signaller during the war and his passion for cycling in the 1930 and 40’s. Lew’s memory was prodigious and he could recall people and incidents in great detail from 70 years ago. Lew was introduced to the radio club in its early years by then secretary, Mike Goode G4SMA, because of his excellent morse skills which he willingly passed on to many club members with great patience, so that they could progress from their B license to their A license. Although never licensed himself, his contribution to the club, both as a teacher of morse, and a good companion to talk to over a drink or two on a Tuesday evening and for many years as club president, taking the chair at the AGM when we elected a new chairman, was valued very much by all that knew him. Lew was brought up in Small Heath Birmingham and was an only child. He went into the printing profession as a typesetter apprentice and then joined the army, before conscription started serving in Ireland, England and in Europe following the D day landings He was a keen footballer having had an offer to join Birmigham City as a boy which his mother refused. Lew loved sports especially cycling an interest he shared with Cynthia his wife..
After the war, Lew returned to the print business and became self-employed. In his later years he ran a business making pattern cutters which he continued to do well into his 70’s. Unfortunately in his 80’s he was then struck down rather suddenly with the loss of his sight and could only make out rough shapes. This rather curtailed him, he could no longer drive his vintage Datsun he so lovingly cared for, nor could he read or watch TV. Lew started taking buses to get his shopping and because he lived on a busy road he would often take the bus from his house at Alcester Lanes End to Kings Heath and to avoid having to cross the road on the return journey he would take the bus from Kings Heath to the Maypole, cross over the road at the level crossing and take the bus back to Alcester Lanes End (they do run every 5 mins). Later on he succumbed to various cancers, the treatment of which he met with fortitude and courage but eventually the disease was to take his life. We all have fond memories of some of Lew’s stories. The one I remember was him telling me that he liked a little tipple of sherry in the evenings and that Safeways had a special offer of 3 bottles for some low price at Xmas time. Lew went in and bought his three. Came out, changed his hat and coat and went back and bought another three. We all had a good laugh at that one. And that is how we will remember him for his humorous stories, even his war experiences, though tragic at times, had a strange comedy to them. We shall miss you Lew. RIP old Chum. The club will make a donation to Lew’s chosen charity St Dunstan’s which looks after blind ex-servicemen who need respite care.